Less onboard memory, fewer cores, lower MSRP. Just when it seemed like things were settling down in the graphics card department, Nvidia has come out with a version of its GeForce GTX 1060 that has half the amount of RAM (3GB versus 6GB) and a lower sticker price at $200 MSRP, putting it in direct competition with AMD's Radeon RX 480 4GB. It was rumored Nvidia would release a 3GB version of its GeForce GTX 1060, a card that we gave high marks to (check out our review of the 6GB model). Turning rumor into reality, Nvidia's hardware partners have started announcing their own versions of the new card. 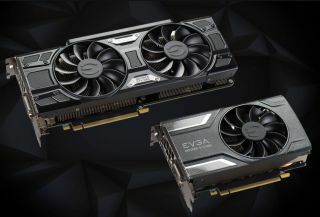 Only the bottom model is currently in-stock and ready to order direct from EVGA, at Nvidia's $200 MSRP. It's a shortened card measuring 6.8 inches (172.72mm) long with a single ACX 2.0 cooling fan. Speeds and cooling vary by model, though all of the 3GB cards have fewer CUDA cores (1,152 versus 1,280) and one less simultaneous microprocessor (9 versus 10), which brings the number of texture mapping units (TMUs) down to 72 (from 80). Nvidia's reference blueprint leaves the rest of the specs alone, including the base (1.5GHz) and boost (1.7GHz) clockspeeds, and 192-bit memory bus. Where that leaves performance is something we'll have to test once we get our hands on one of these new cards, though Nvidia tells PCWorld that it's about ten percent faster than AMD's Radeon RX 480. Given our own numbers put the 6GB model at ten percent faster and Nvidia has disabled an extra SM, it's probably pretty close to performance parity with the 4GB RX 480.